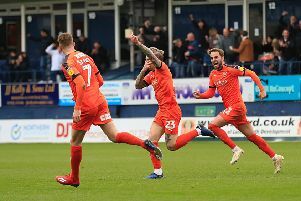 Hatters striker Danny Hylton knows full well that Town boss Mick Harford had his back during his recent goal drought. The attacker went almost five months without a goal, after injury and suspension hampered his season. Mick’s a legend, so if he’s got your back, then you’re not going to be too far off are you? He netted in the 2-0 win over Rochdale though earlier this month and was back on the scoresheet again during Saturday’s 2-2 draw against Gillingham. Hylton was quick to praise Harford for his unwavering support though, saying: “He’s got everyone’s back, we’re a team, we stick together. “No-one points fingers, no-one blames anyone, if someone makes a mistake, it’s all our fault, we’re a team. “Luckily enough I’ve had that the whole time I’ve been here, always had confidence put in me. “There’s not been too many times where I’ve gone a period of time without scoring, but now I have, no-one gets on your back, there’s a bit of banter in training and stuff like that, but it’s all light hearted. The duo did have a meeting recently after Hylton was taken off by Harford in the first half of the 0-0 draw at Plymouth for fear of being sent off by referee Darren Drysdale, despite doing very little wrong. Hylton continued: “We had a chat, he said he didn’t want to do it, but just said he didn’t trust the situation at the time. “That’s the way it is, the ref thought it was a yellow card, so you’ve just got to accept it. “It was the right decision and a game that we still should have won. Hylton showed his predatory instincts once more at the weekend when scoring from close range after Callum Reilly’s intended clearance dropped for him. He said: “As a forward, you’ve got to try and stay alive, stay bright for any chance, that might happen. “Luckily it fell for me and I managed to score, but I’d trade the goal for three points, if you offered me that. “It’s not about any individual or me scoring, or anyone else scoring, we want to win games. “It felt like a bit of a missed opportunity after leading twice, but it’s been a long week, Gillingham played well, the lad scored a great free kick. Team-mate Pelly-Ruddock Mpanzu added: “Collo’s (James Collins) been banging the goals in, but Hylts, he’s a goalscorer and he put one in.